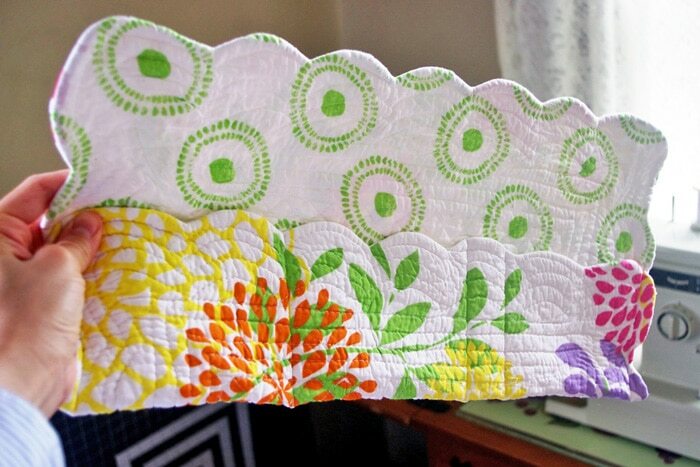 When I visited my friend Jennie in West Virginia a few years ago, she wanted to show me how to recycle a cloth placemat. Say what? With little ones, we never saw a point to those placemats anyway. Can you imagine how stained they would be after just one spaghetti dinner? 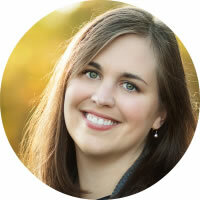 So when Jennie demonstrated how to turn a pretty quilted placemat into a nook for special items, I knew that was something this mama could use! 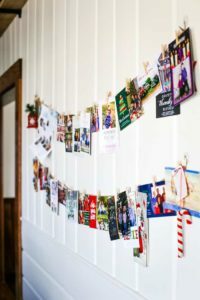 I’d like to store my homemade cards and envelopes together with a book of stamps. I’d also like to have unchewed pens and unscribbled paper in a safe place for when I need them. Need a carry along with your Bible? A place to put coupons? 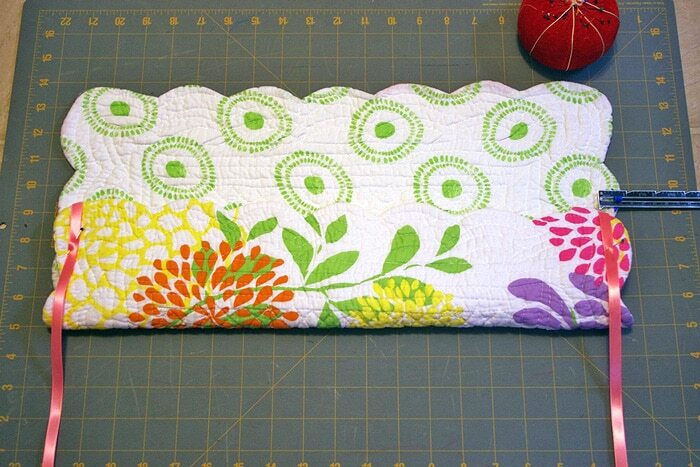 This DIY Placemat Organizer can serve all of those purposes and more! 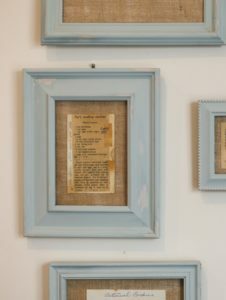 With Mother’s Day around the corner, this can be both a fun and simple project to bless mom. What a great gift for your child’s teacher too! 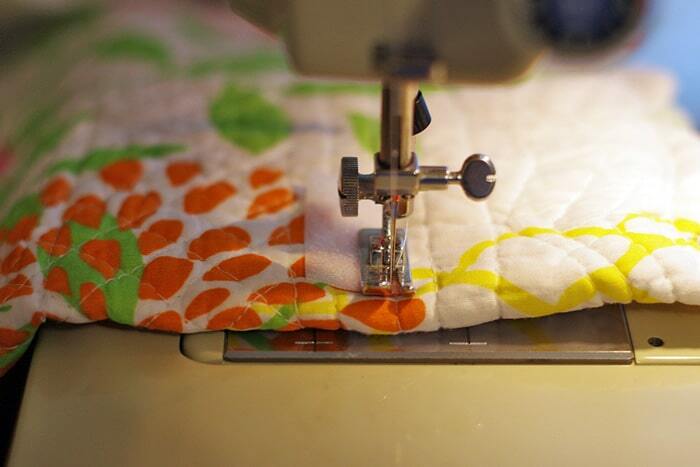 All you need is a pretty quilted placemat, a basic sewing machine and a few other tools. 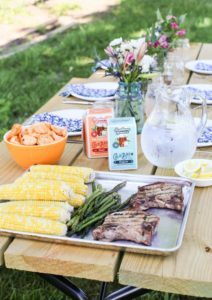 Are you ready to make a DIY Placemat Organizer with me? Come on in to my home! 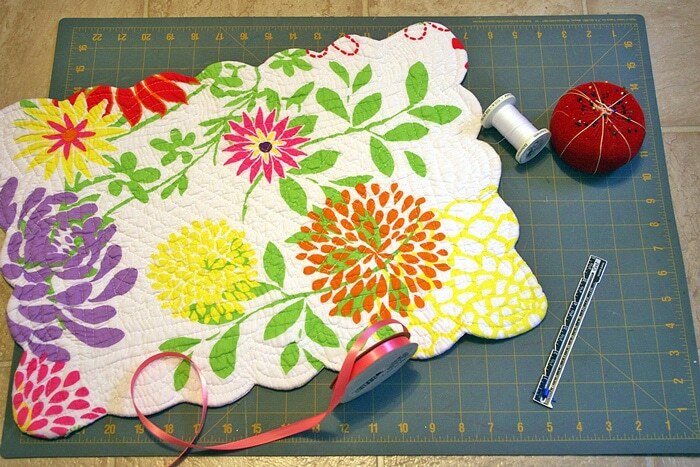 You will need one reversible quilted placemat. 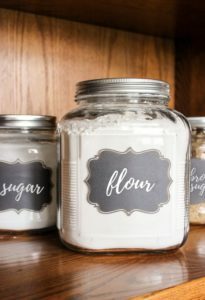 Home stores will often have some on clearance or you can buy one online. I got mine through Amazon. 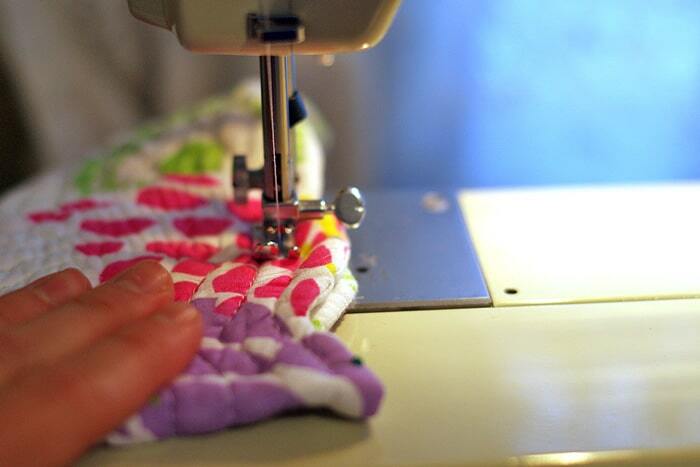 You will also need a basic sewing machine, a good ruler and a marking pen. I forgot to put it in the picture, but I use a water soluble marker that I bought at my local fabric store. 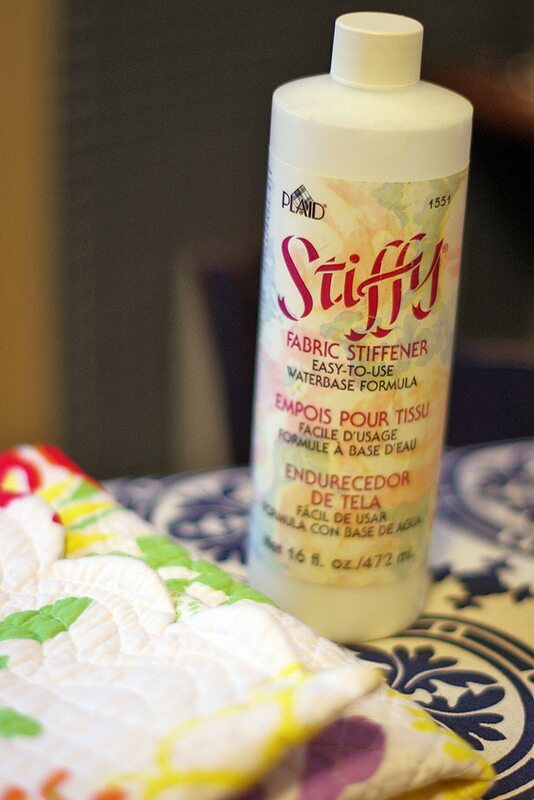 If you want your organizer to stand up on its own, you will also need a bottle of fabric stiffener (yes, they make such a thing!) and your choice for a closure – ribbon, Velcro, snaps – whatever you want. To begin, turn your placemat over and bring the bottom of it halfway up long ways. Mark vertical lines 1/2 inch in on both ends. Here, I am showing you with ribbon so you can envision the lines. 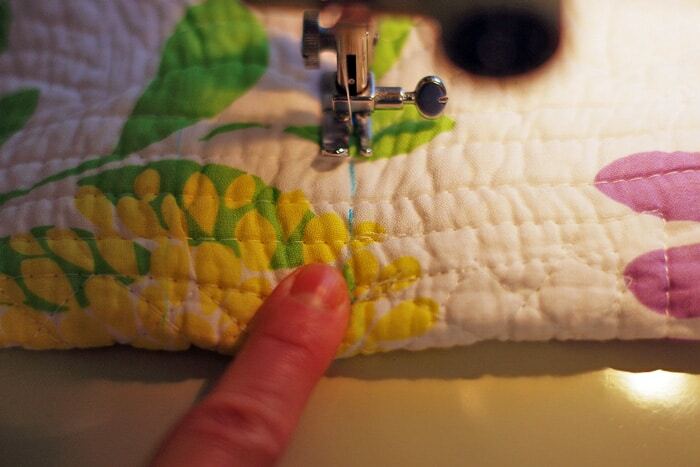 Using a straight stitch, sew your vertical lines on each end to create a long pocket. Next, mark three more vertical lines. The first line needs to be 5 1/2 inches from the end seam you just made on the right side. The second line is 1 1/2 inches to the left from the first line and the third is made 5 1/2 inches to the left from the second line. In total, you will have five stitched vertical lines – two on the ends and three in between. Remember that water soluble marker? They are great because their colored marking helps you sew straight. When finished, simply wash away the marking with water. If you don’t have one, you could use a soft lead pencil and an eraser. 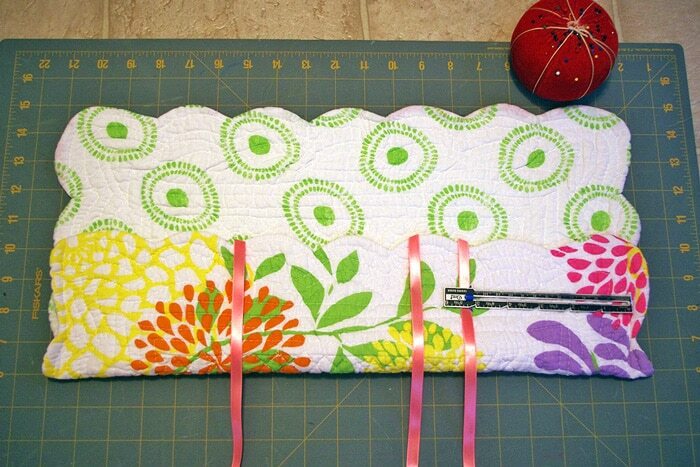 When finished with the sewing, you will have made three 5 1/2 inch pockets and one 1 1/2 inch pocket for a pen or pencil. The project is technically finished! You could fold and collapse the organizer, add a fastener to close if you want and pop it in your gift bag, but I found that one more step takes this project to a whole new level. Introducing… Stiffy! This is a liquid fabric stiffener that will harden our placemat so it will stand on its own. 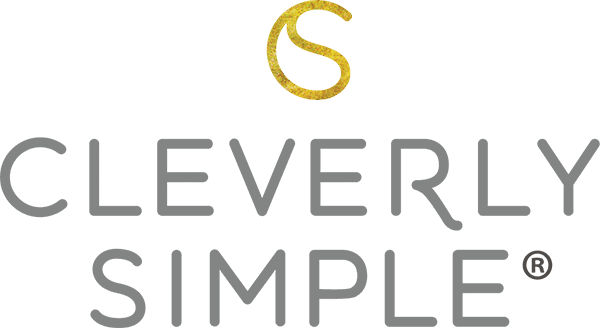 Several companies make a similar product. Look for terms like fabric stabilizer, stiffener or draping liquid. 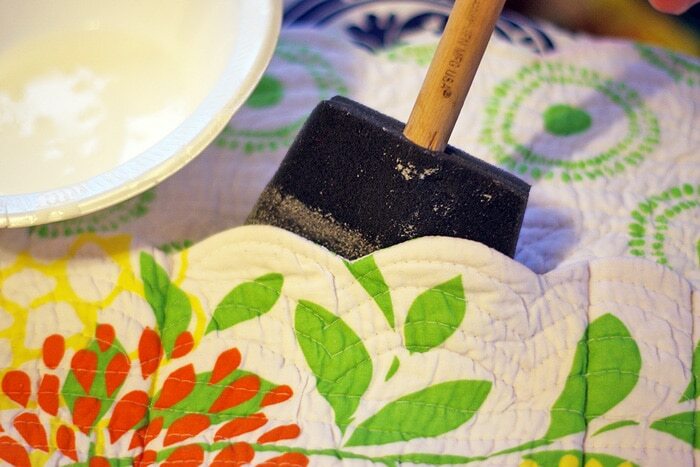 Using a foam brush, generously brush the fabric stiffener into every inch of the placemat. Next, hang the placemat to dry. I left mine hanging overnight to make sure the stiffener had time to work. Wa-lah! I’m holding up my placemat with one hand to show you that this baby is stiff as a board! We’ll still be able to make our folds, but the new texture will make the organizer easy to carry and more stable for cards and pens. I decided to add sew-on velcro to finish off my project. I sewed two top and bottom hooks on the inside right and two top and bottom loops on the outside left. 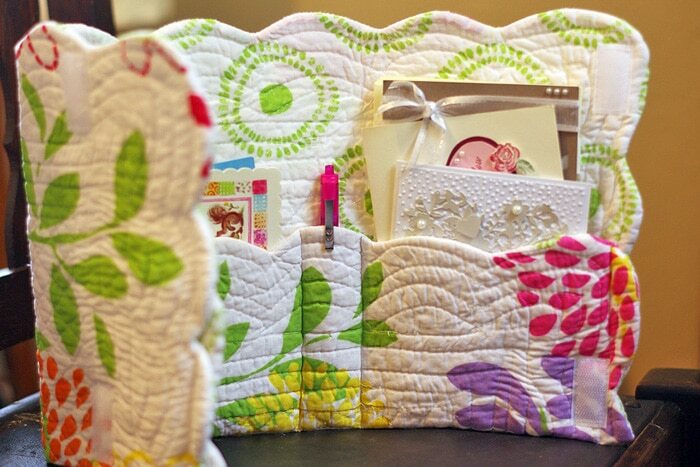 Snaps and ribbons work too – or you can just rely on the folds to close up our organizer. 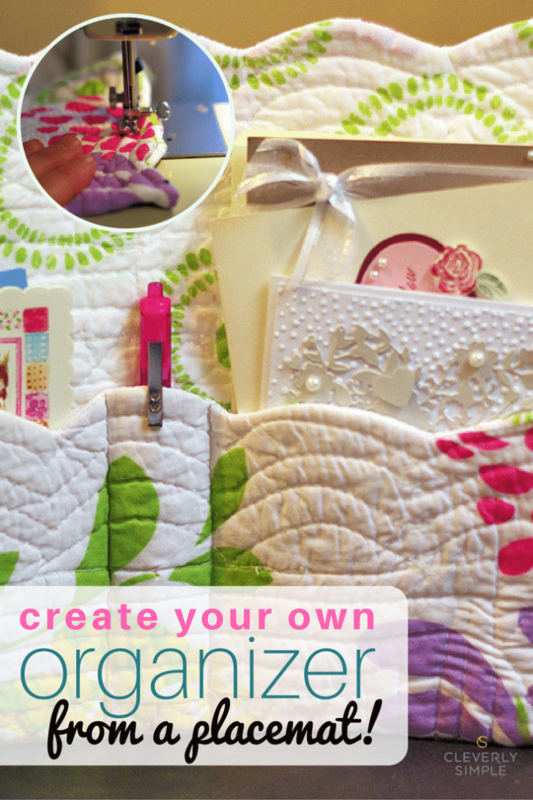 Our DIY Placemat Organizer is ready for cards, notepads, pens, coupons, recipes, candy bars (shhhh!) or any other treasure you’d like to store 🙂 It can be a gift or something useful around your home. Either way, our pretty placemat has turned practical.